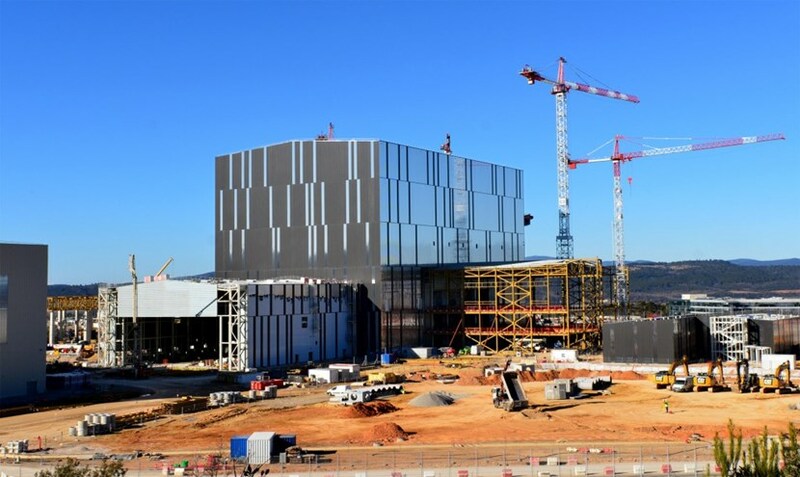 The steel structure that's being erected against the northeast side of the Assembly Hall is for a large building that will be densely packed with power supplies and energy convertors designed to deliver 40 MW of heating power into the ITER plasma. Originally planned for installation in the Assembly Hall, ICRH and ECRH equipment (power supplies and generators) will now have a building of its own. It's a more optimized solution in terms of both cost and schedule, allowing work on the installation of the systems to begin at an earlier date. The space inside the building will be shared by two radio-wave-generating systems designed to feed energy at frequencies that match the oscillations of the different particles inside the plasma—a matching called "resonance." Deuterium and tritium nuclei, or ions, will be "heated" by ion cyclotron resonance heating (ICRH); while electrons will be "heated" by electron cyclotron resonance heating (ECRH). By way of collisions, electrons will in turn transfer the absorbed energy to the ions. In ITER, the ECRH system also generates the "spark" that, by ionizing the deuterium-tritium gaseous mix, starts up the plasma discharges. Both heating systems are based on the same principle: the conversion of electrical power into electromagnetic radiation. However, the technology they rely upon and the wave frequencies they produce are considerably different—the ECRH system can be compared to a microwave oven, with the "food" replaced by the plasma, while the ICRH source is like a powerful radio transmitter of the kind that is still used to broadcast information from one end of the world to the other. Both systems require considerable amounts of electrical power to operate. In the Radio Frequency Building, massive transformers and rectifiers will convert the industrial 22 kV AC into DC for the wave-generating gyrotrons of the ECRH system and for the tetrodes (akin to vacuum tubes) of the ICRH system. The imposing building—50 metres long, 43 metres wide, 25 metres high—will be complete in early spring, allowing work to begin on added services. The building is imposing—50 metres long, 43 metres wide, 25 metres high—but from the perspective of its future users it is barely large enough. Power supplies (a total input of 100 MW) for both resonance heating systems will occupy the better part of the first two floors, while the top floor will be occupied by the wave generators. Generators too need a lot of space: on the ECRH side for example, twenty-four 2.5-metre-high gyrotrons —each giving out the equivalent power of 1,000 kitchen microwave ovens—must have an interspace of five metres between them in order to avoid magnetic interference. 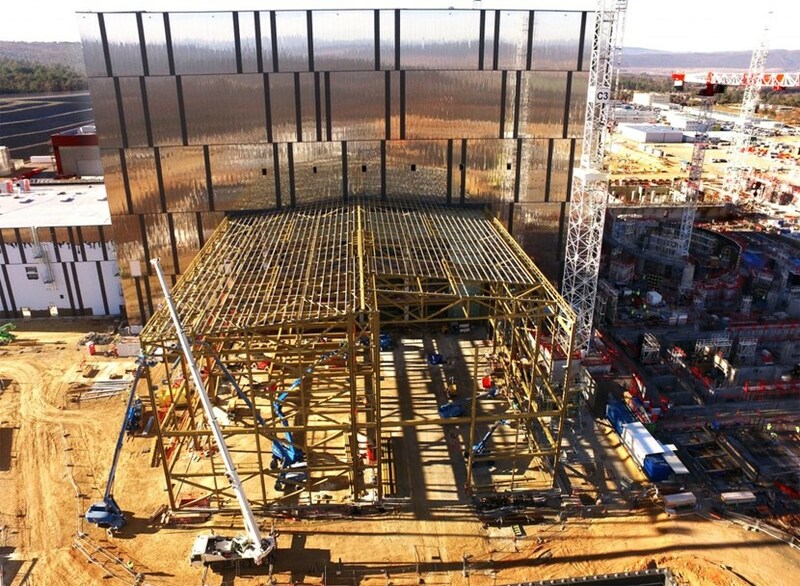 Once generated in the Radio Frequency Building, the energetic radio beams must travel 100 metres along transmission lines all the way to the tokamak, where ECRH "launchers" and ICRH antennas—both massive components weighing up to 45 tonnes—will deliver them deep into the plasma. Installing the sources at a distance from the machine is a choice dictated by magnetic issues: if they were any closer, the intense magnetic field of the tokamak would disrupt that of the generators' gyrotrons. Over the next few months, the building will evolve rapidly. Soon, the internal floors and side walls will be added and by early spring the building structure will be complete, allowing work to begin on added services. By mid-2018 the power supplies will be progressively installed, followed by the ECRH gyrotrons and ICRH tetrodes during the years 2019-2020. See related article in this issue: "Men of measure."